Just got an email saying that Flickr is being acquired by SmugMug. Since I was about to open a SmugMug, good timing! 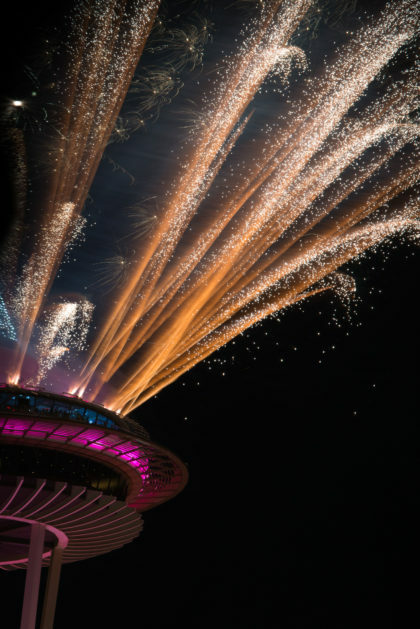 In what I hope to make an annual thing, I’d like to use this post to look back over 2017. The travels, what cameras/lenses I favored, and what my favorite images of the year are. Here we go, starting with the most straight forward items. In 2017, I created 21,446 photos and 268 videos. This makes 2017 my second most prolific year of photography, after only 2016. It was only slightly above 2011, which is now in 3rd place. 2017, like 2016, was dominated by a single trip – in this case, my trip to Greenland. 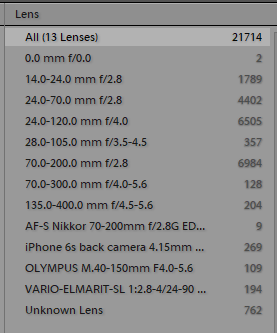 This trip was responsible for 13,298 of the photos and videos. 2017 was otherwise a very low-photo year. My lowest since 2012, when I last moved across the country. 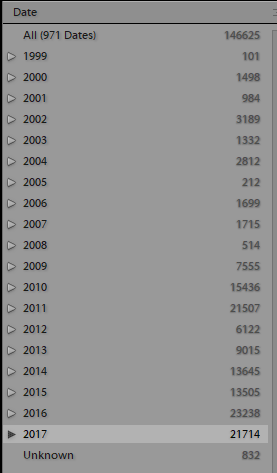 For cameras per year, it is clear, I favored the D750 over the D800, which is the second year in a row. It really wasn’t even close. I think the weight of the camera, combined with the high burst rate really led me to favor this camera. I also like to use this camera for night time time-lapse/star trails, which artificially inflates the camera usage – 1000 photos taken may only result in 1 final image. The Leica is the only camera on the list that I do not own. I had the chance to use it for an afternoon, which was a ton of fun. My favorite lens for 2017 was the Nikon 70-200 f/2.8, followed closely by the Nikon 24-120 f/4. 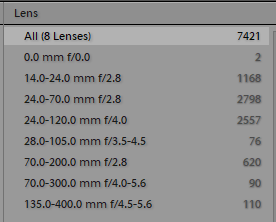 It actually surprises me that the 70-200 is so high up on this list. 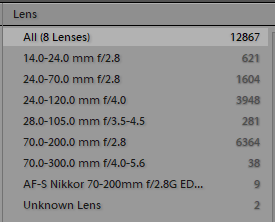 This is due to my Greenland trip where I heavily favored this lens. The Greenland trip was responsible for 5481 of the 6984 photos taken with this lens in 2017. I know that simply a large number of images doesn’t equate to a large number of images you like. A large number of images only means you consume a lot of space on external disk drives, which 2017 certainly did. 2017 consumed 814 GiB, which is certainly a record for me. Originally I was going to put my favorite images of 2017 in this space, but I’ve decided to hold that for a new post in the next week or so. Knowing me, it will take longer, but we shall see. 2017 was a small year for purchases. I purchased a new camera bag for international travel and a new travel laptop. My trip to Greenland was by far the largest excursion of 2017. Other than this trip, I had a weekend in Utah; some day trips in and around Seattle; and some visits to family that allowed me to take some photos. I hope this section doesn’t have large entries every year. But this year has a frustrating entry. This year, my D750 was subject to a recall on the shutter. When I received the camera back after the first repair, there were issues with the reassembly of the camera. It had to go back in to be reassembled properly. I was lucky, as the camera nearly didn’t make it back to me for my Greenland trip. But, I am also thankful to Nikon who went out of their way to ensure that happened. I am also quite thankful that my D750 has a brand new shutter. 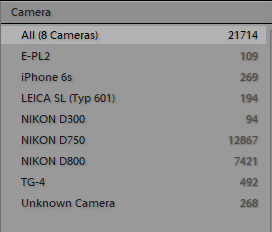 While my D750 has taken nearly 30,000 photos, the shutter only has around 6900. The D750 will likely continue to be in use for 3-6 more years. Outside of this, my gear experienced nothing more than normal wear and tear. Let’s now look at my plans for this current year. Due to job-related reasons, I’ve relocated from the PNW to Pennsylvania. But I’ve found a nice place near my new job and not too far from the outdoors. So I’ll be photographing a new area of the country with new parks and things to explore. I’ll also be visiting the Atlantic Ocean, which is fun. In 2018 I hope to have a few more business-oriented aspects to my photography. Until now, it has been mostly for fun. 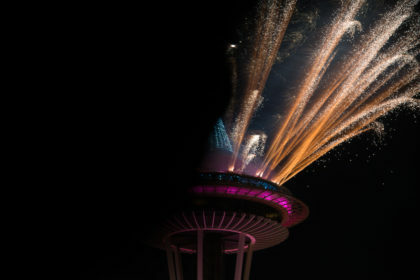 In this new year, I hope to pursue tasks which offset the cost of my camera gear and travels. More details as they become available and I can actually make them happen. I’m also testing the water with video and learning the basics of producing a video. I have an idea that I hope to launch in 2018. I was recently fortunate enough to be able to travel down the Colorado river and photograph the Grand Canyon. 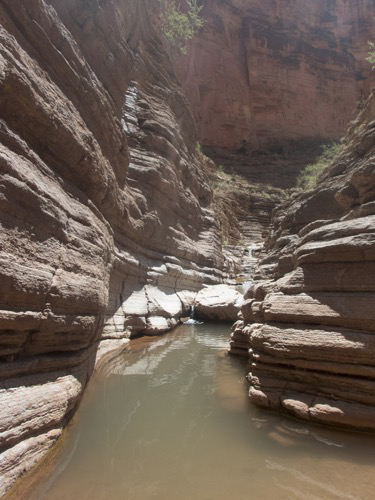 One of the lunch stops on this trip was at Matkatamiba Canyon, which is at mile 148, just before the Matkatamiba Rapids. 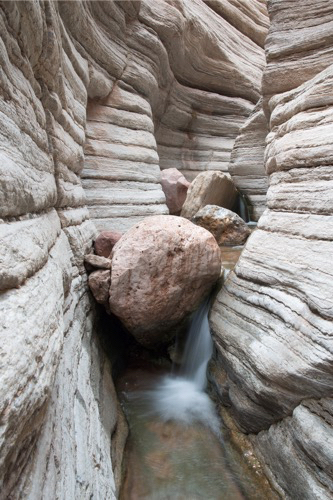 Our goal was to make it up to one of the waterfalls in the slot canyon and photograph it. 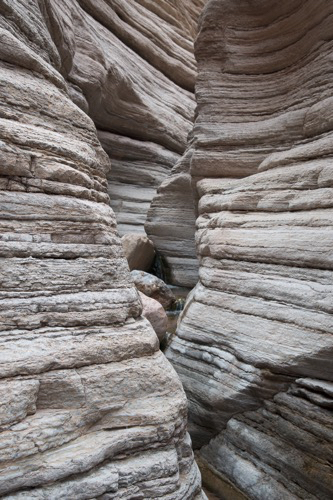 Due to how this canyon winds around, it can support a lot of photographers at once at most locations. Upon arrival, we found the entranceway had deeper water than there was in previous years. This was not off to a good start. We had to cross a neck deep path with camera gear. While I may have been able to make it, some of the shorter members of the group would not, or at least their camera gear would not. 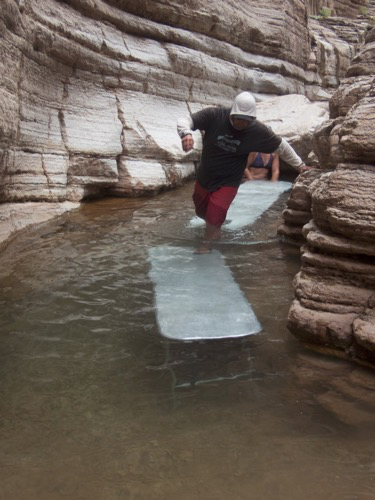 The solution was to use some of the folding tables as a bridge. Some of the other people in the group decided to climb the rocks and make it over. 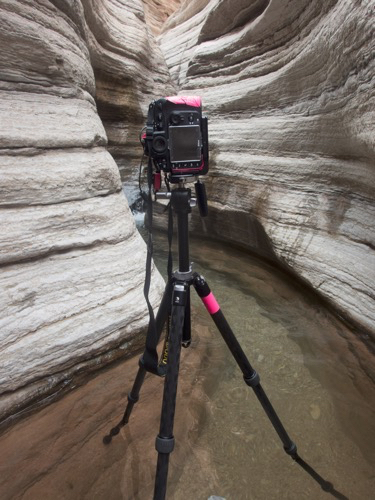 Being taller, I took the option of holding my camera gear over my head and wading through the creek. 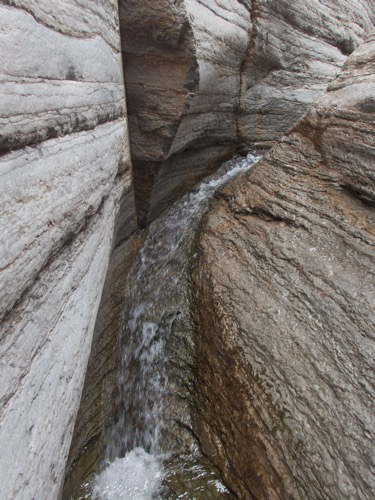 After passing through this creek, there were two waterfalls to climb. While this first one doesn’t look like much, the right side was extremely slippery, and, at least two people fell. One person managed to have their camera call into the water, but, it was an older Canon 1D series, so it was fine after it dried out a bit. After this waterfall, there was a chest deep section, followed by a waist deep section, followed by another waterfall to climb. I do not have any pictures of this last waterfall, because there were a bunch of people trying to photograph it, and I wanted to get out of their frames as fast as possible. 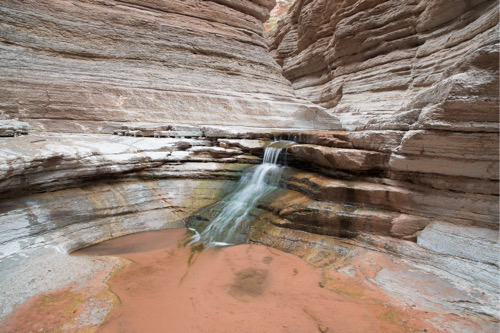 At this last waterfall, the slot canyon narrows greatly. I was able to take a quick stop about 1/3rd of the way up to take this photo. There was a small pool here where I could take a small break from the climb. I was now at a point where only a handful of people would try to venture. Once I got to the top of the stream, I took a look around the corner. This looked quite nice, and very well could have been my shot. I decided to set up and take a few shots while deciding how much further I wanted to go. As I was debating whether to continue up or turn back, some other members of my group showed up. One of them climbed up and let us know we were about as far as you could go. I decided if I was almost there, I might as well go to the top. So I did. About the time I got to the top, a few people were ready to leave. The guides then showed up, having taken a goat trail to get there. They helped a few members of my group get out and head up the trail. A few members of my group decided to start to venture back down the creek. I then had it all to myself. Since I had all of my camera gear, and a great little spot all to myself, I decided not to waste it, and, carefully set up my camera. At the bottom of the area, there is place to put bags down and keep them mostly dry. Here, there was no such spot. The pink duct tape on the camera serves a few purposes. #1 – Identification – by the first day, everyone knew that Pink Duct Tape was mine. 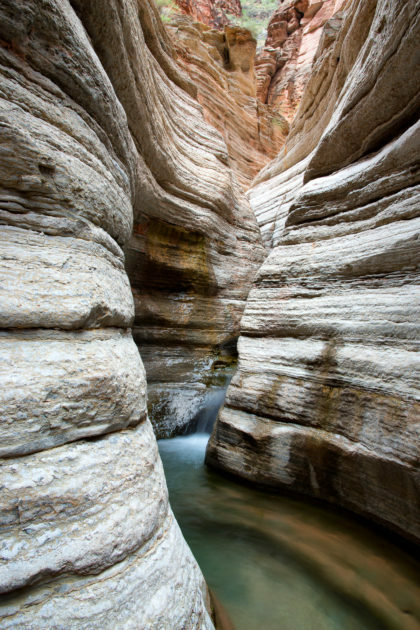 #2 – Dust Protection – the Grand Canyon has very fine dust that gets everywhere. The duct tape helped keep this dust out of the sensitive parts of the camera. #3 – Pink = Professional. My other camera was marked with Star Wars Duct Tape, so I could tell them apart at a distance. And here, after all of that story, is the final image. It only took about an hour in Photoshop to get to this point. I was very close to having a great post tonight about my recent trip to the Grand Canyon. However, I use the software called ‘Blogo’ to write my posts. It had an incident, and, it ate the post I had spend close to 2 hours working on. So it will be a bit longer before I have the post ready. Also, while attempting to write this post using the software, it refused to give me a box to type in. I had been quite happy with the software before, but after tonight, I think I’m done with it.